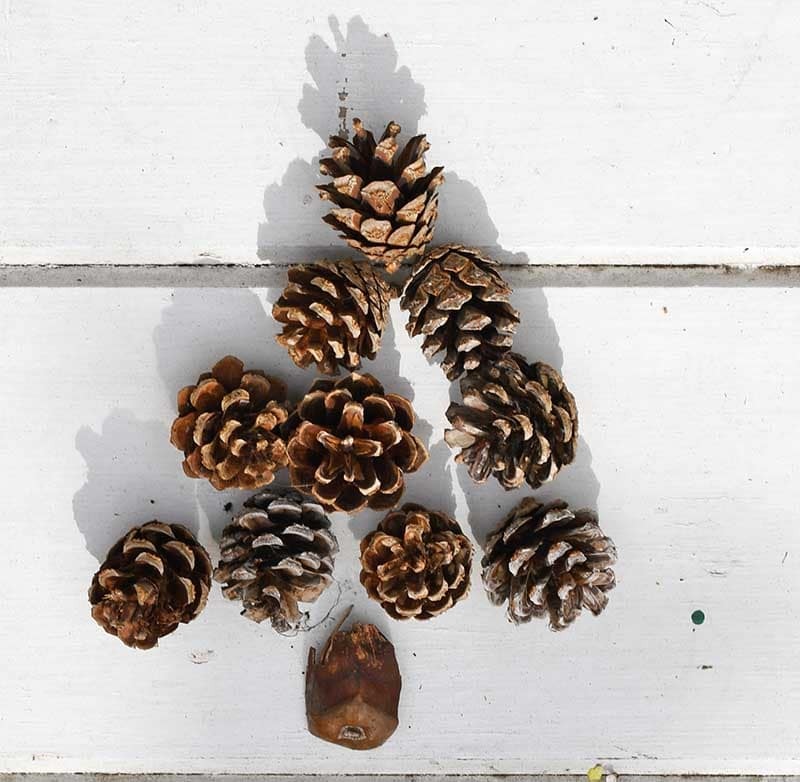 I say that this is a pinecone Christmas craft but it is really just a fall craft. 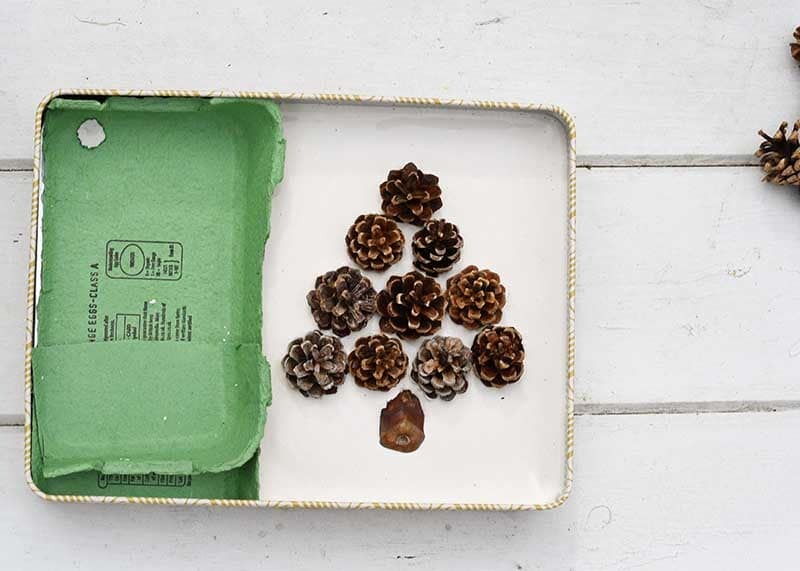 However, by adding some decorations all of a sudden it’s a pinecone Christmas craft. Come rain or shine nearly every morning I stop at the kiosk in the park at the bottom of my road for a coffee. They give out free dog treats with every coffee so Toby insists on it! There are several pine trees next to the kiosk and one of them has the cutest little pinecones. They are so sweet that I have a habit of pocketing a few and bringing them home. Recently, I used them to decorate some fall mason jars. 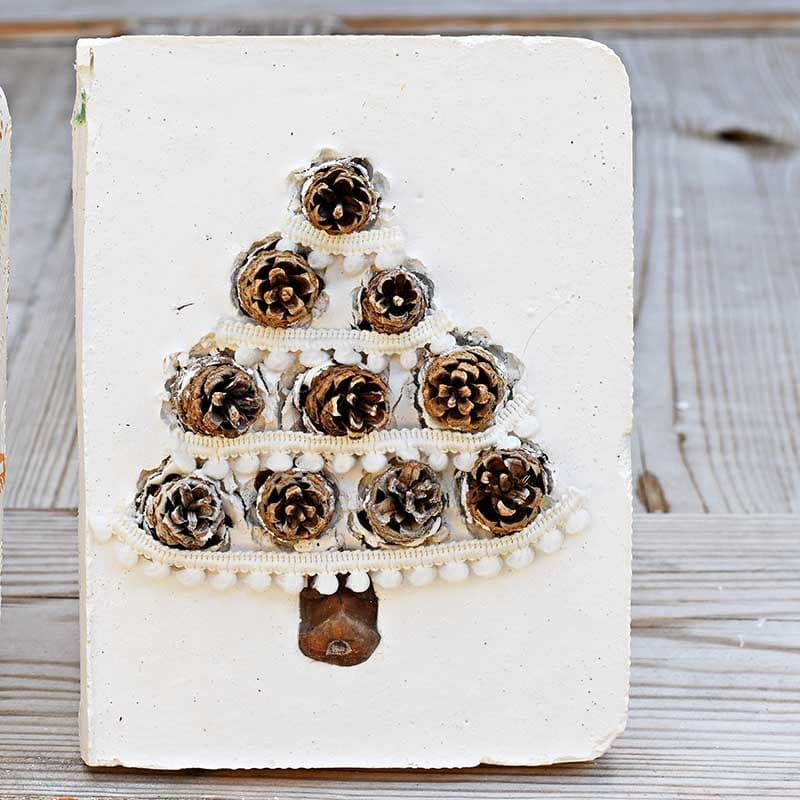 This time I used Plaster of Paris to make some unique decorative pinecone tiles. 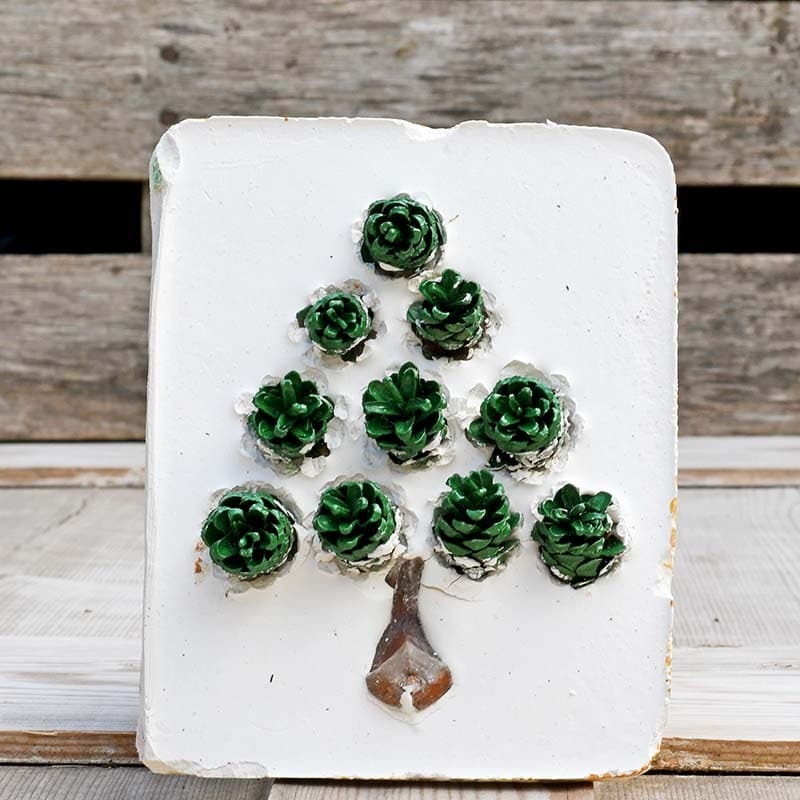 These pinecone tree tiles look great on the mantle just as they are. It is also very easy to make them into a pinecone Christmas decoration by simply adding pom pom garlands to the trees. I made 2 of these tiles. One I left natural and with the other I painted the pinecones green to make them more Christmassy! 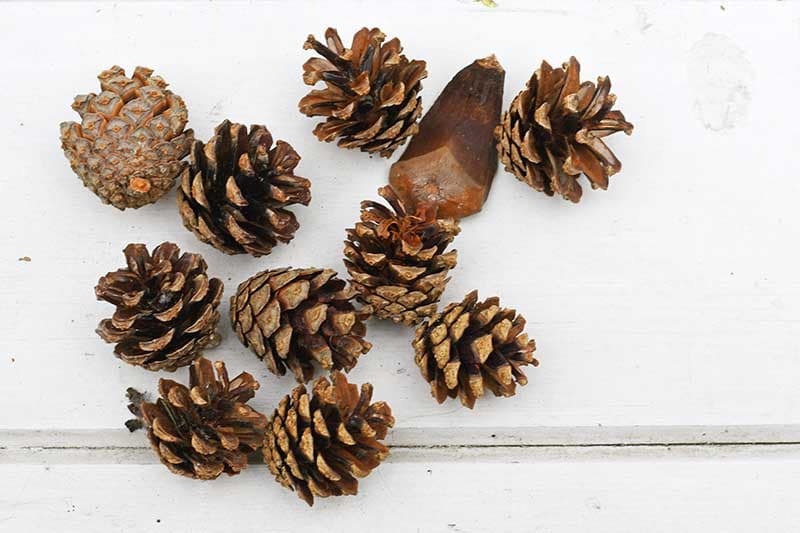 Small pine cones – 10 for each pinecone Christmas tree. You will also need a pinecone petal/scale from a very large pinecone (or a piece of bark). 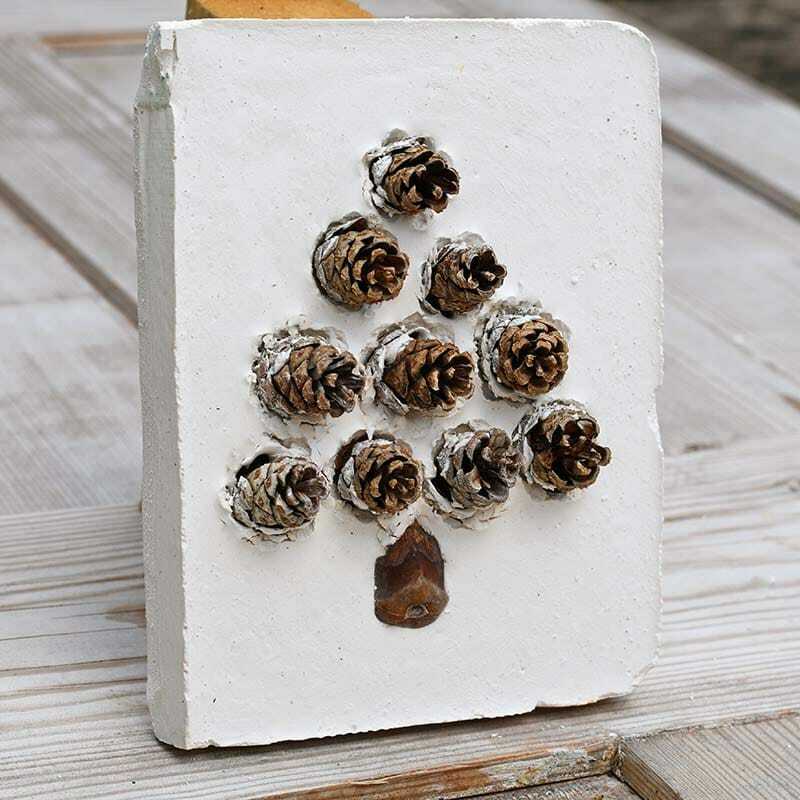 Plaster of Paris – I used about 250gram per Pinecone Christmas tree tile. 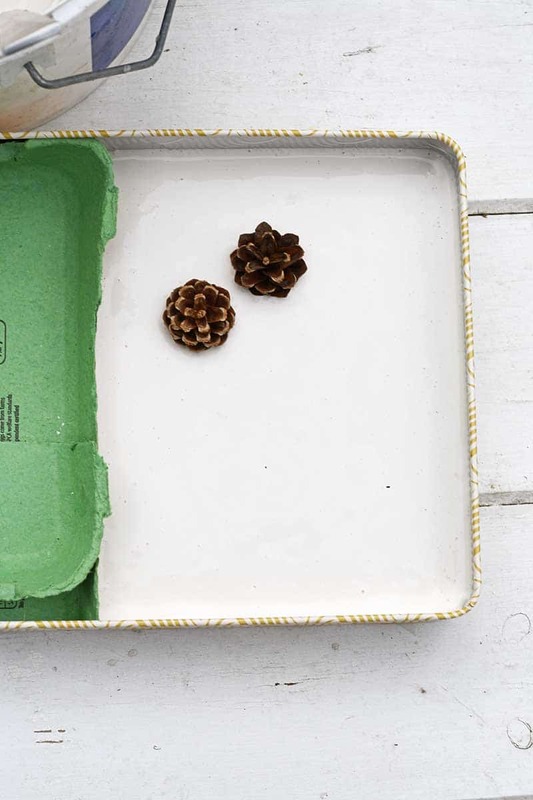 Tin or box that you can use as a mold for the plater of Paris pinecone tile. 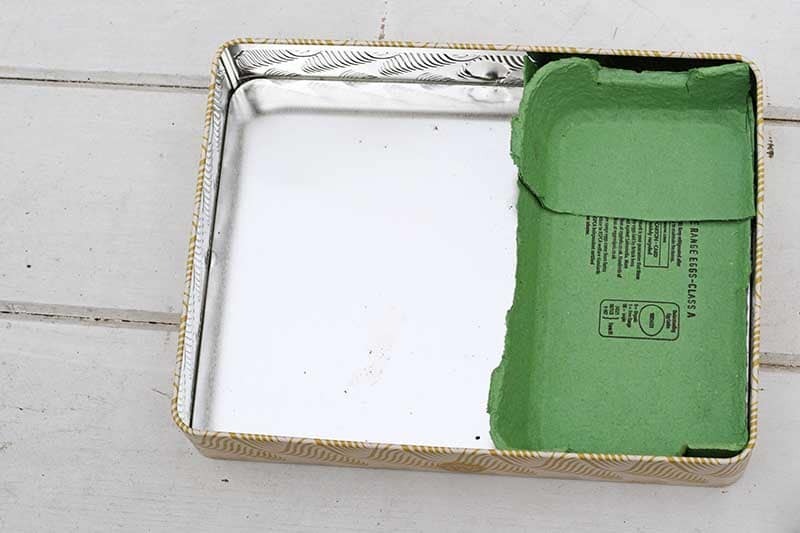 I had an old chocolate box tin that I could use. This was a bit bigger than I wanted so I just cut up an egg box to inserted into the tin to make a smaller more square mold. First pick out 10 pinecones and arrange them losely in a pyramid shape. With one pinecone on the top, then a row of 2 and a row of 3 finishing off with a row of 4. Use either a large pinecone petal/scale or piece of bark as trunk. 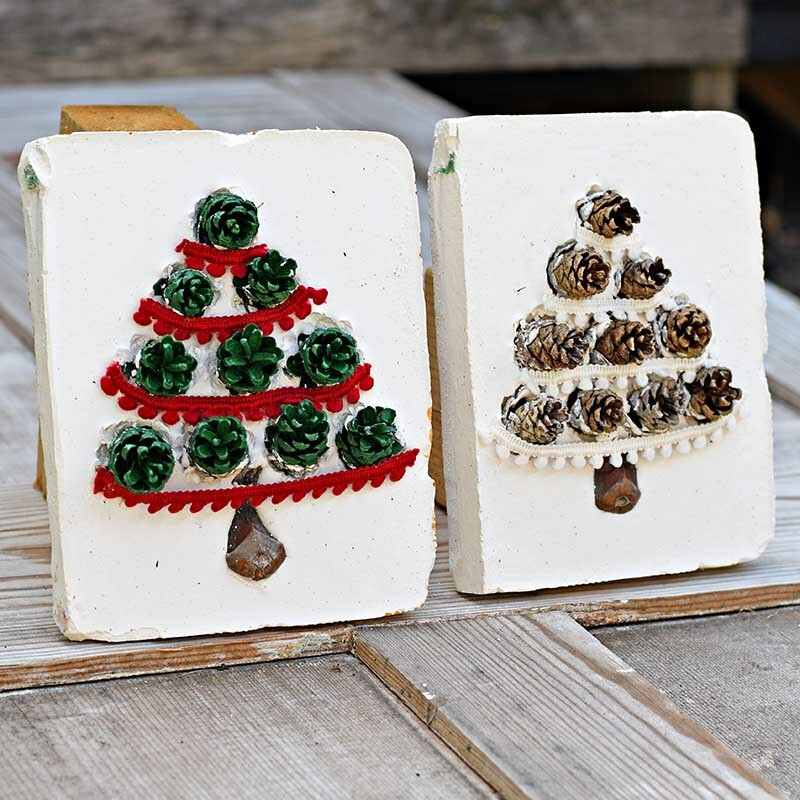 Once you are happy with your pinecone Christmas crafts design and are sure it is the right size for the mold. You are ready to mix the plaster of Paris. With plaster of Paris it is imporatnt that you add the powder to the water and not water to the powder. 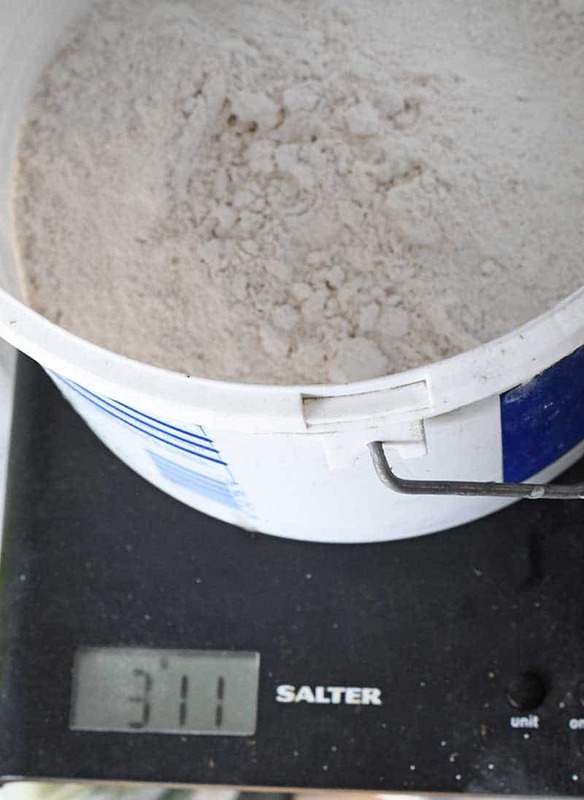 I used approximately 250gm of plaster powder to approximately 200ml of water. When you mix the powder into the water you will want to have it the consistency of double/heavy cream. The plaster will set in about 15 mins so you will need to work with it straight away. Pour the plaster liquid into the tile mold. Tap the tin to even out the mixture and to remove big bubbles. Next place the pinecones in the pyramid shape that you designed earlier. 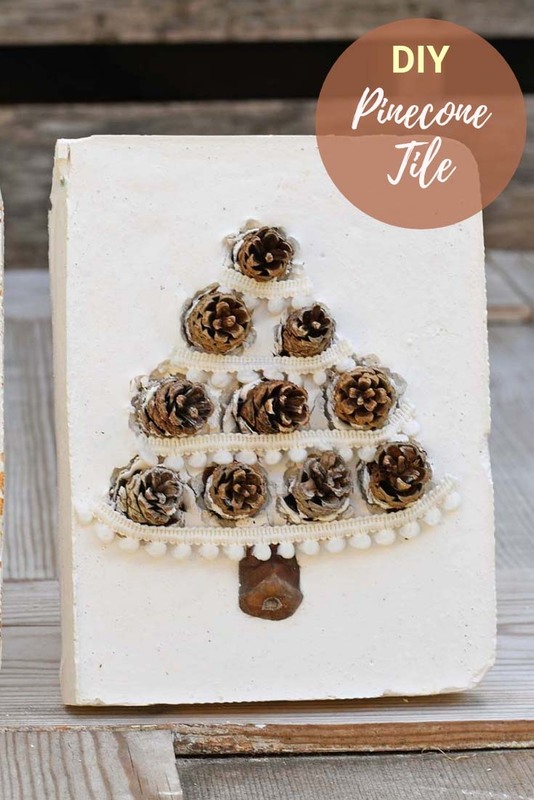 The pinecones should sit with their bottom third in the plaster mixture. Even though the plaster will start setting in 15mins, leave it for a couple of hours before removing it from the mold. 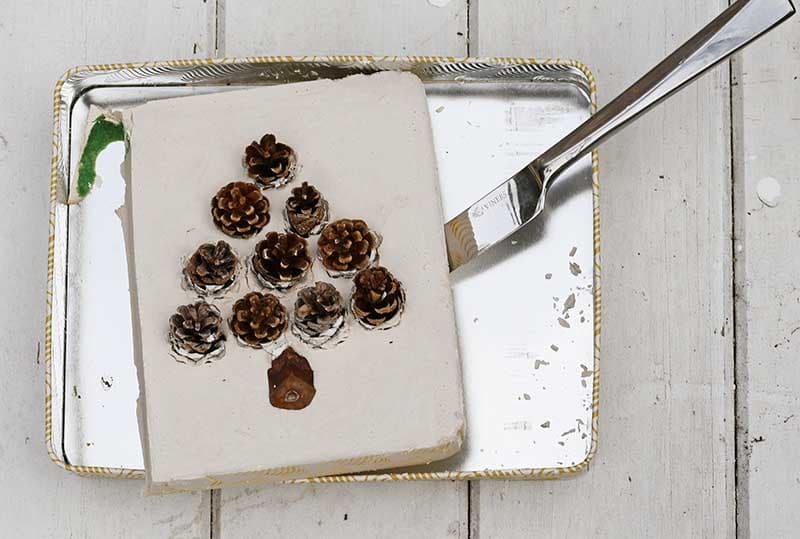 Use a knife to gently prize the pinecone tile out of the mold. 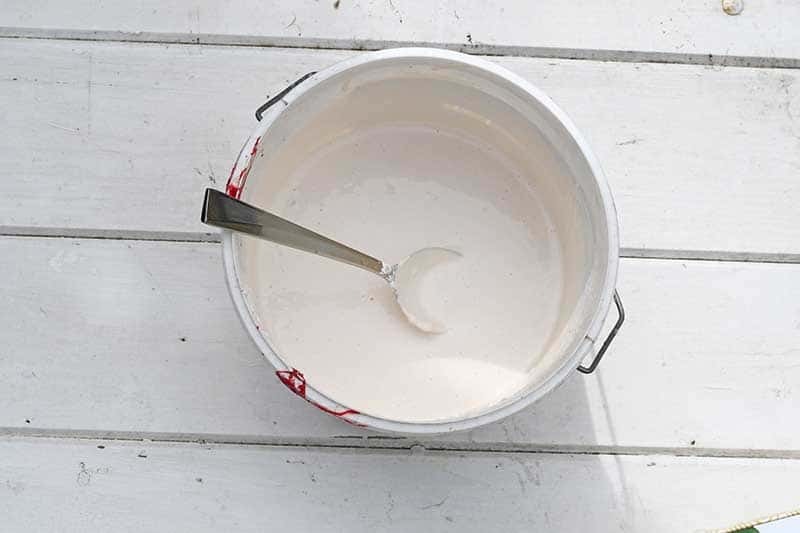 Plaster of Paris is easy to sand and scrape into shape if you need to, to finish off. 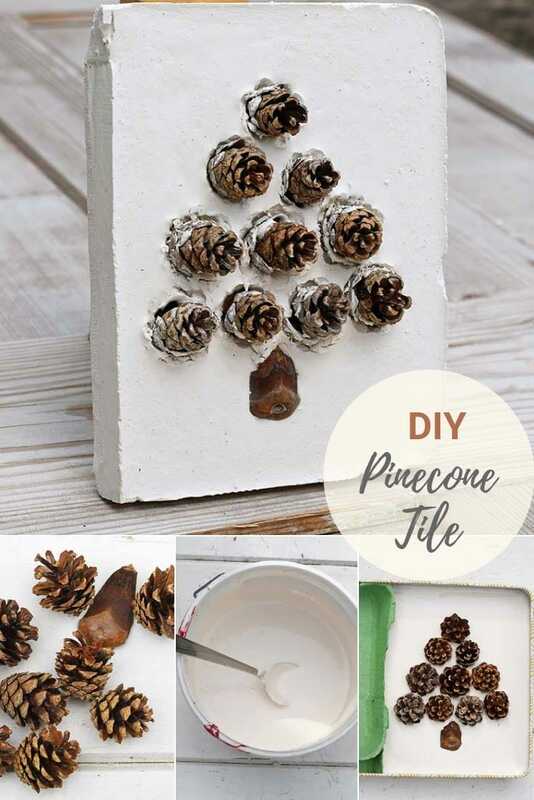 To turn these tiles into a pinecone Christmas craft, use pinecones that have been spray painted green beforehand. And add pom pom trim as a decoration. I used glue dots to hold the pom pom trim so that it could easily be removed without damaging the tiles. I also added some pom pom trim to the natural pinecone Christmas craft. The mini white pom pom trim looks a bit like snow hanging off the pincone tree. 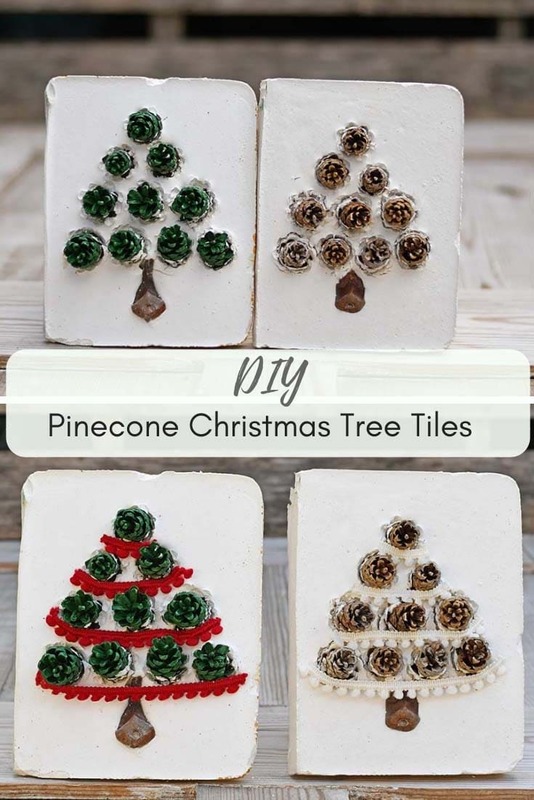 I’m not sure which one I prefer the natural pinecone tile or the more Christmassy green one. I think I will display both together side by side on my mantle. If you like this then check out my pincone Christmas tree light. Or these super cute Christmas cloche with mini pinecones. For other pinecone crafts check out allfreechristmascrafts.com. Love this. Has a farm house look, Can you provide the dimensions? Thank you. You can make it any size you want it will depend on the size of your pine cones. My tiles are approximately 15cm by 10cm. I love both but the traditional red and green Christmas colours will always be a favourite of mine. Thank you, Julie. Yes nothing says Christmas then green and red! I so lov your fresh ideas, Ms Claire.. I’m working on your Denim Feather project, and with six pine trees in our yard, pinecones are plentiful.. 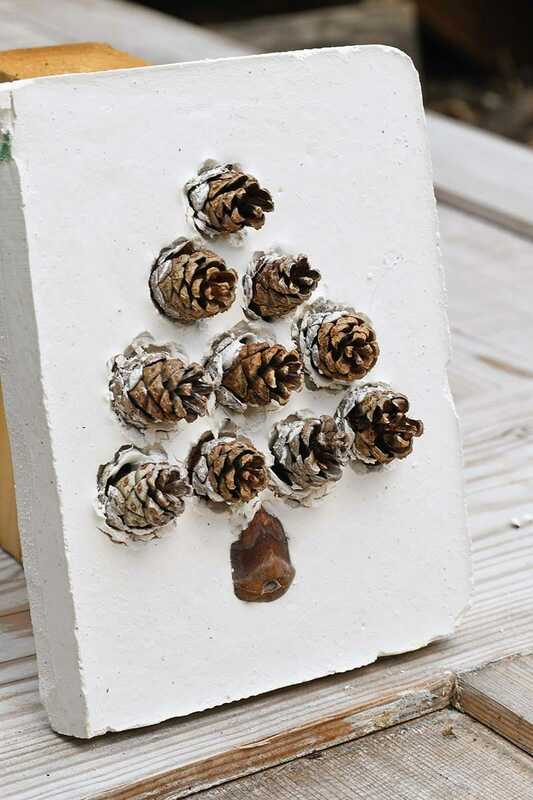 I see your pinecone tree project coming up! Thank you for the time you spend sharing your wonderful crafts..good luck the 25th..have a ball! Aww, thank you so much, Brenda. It’s nice to hear when people make the things I post. I’m really looking forward to the 25th too! Thank you, they do look lovely on the mantle. 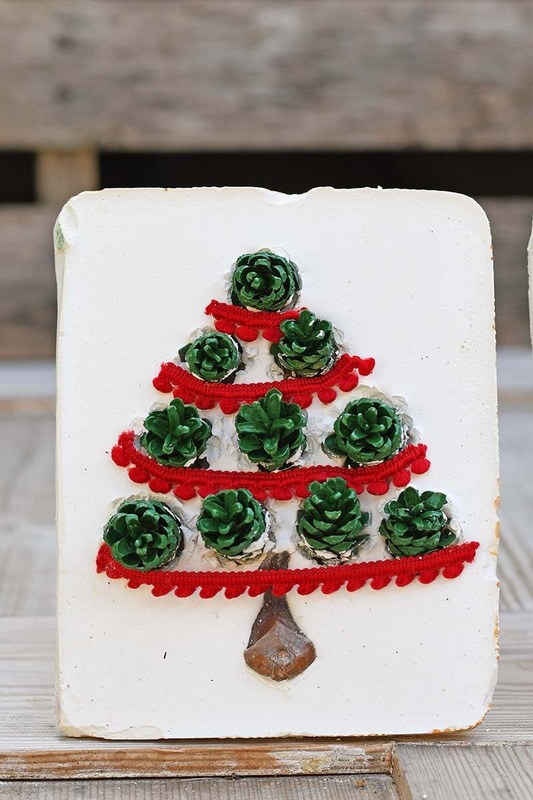 Such a great idea, I love working with pinecones. Thanks for sharing on To Grandma’s House We Go! Love the different textures, Clarie! Thanks for sharing at Vintage Charm! Thank you so much Cecilia. What a lovely project, it looks like the possibilities and the combinations are endless! Love it ;). Thank you. Yes making this has given me other ideas for similar projects.